DoliPos is an easy to use Open Source suite for small and medium businesses that need a Point Of Sale. As with any software of DoliCloud stack, you can install DoliPos in one click (15 days free trial, no credit card required). DoliPos is an extension of Dolibarr ERP & CRM project, developed by international communities. Dolibarr is supported by the Dolibarr Foundation. More information on Dolibarr software project is available on official Dolibarr international portal (links for local communities dedicated to your language will also be found here). DoliCloud is an official hosting service (Preferred Partner) of DoliPos. 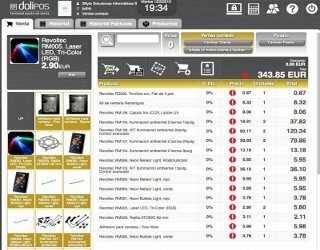 Dolibarr and DoliPos has become one of the most famous and easy to use solution to manage a Point of Sale. DoliPos on Dolicloud is its SaaS variant. Using DoliPos is the best way to manage your Point of Sale at best cost. You benefit a fast and very secured platform with guarantee to have the most competent team on Dolibarr ERP & CRM software (NLTechno and 2Byte company, that provides this service, are the first contributor on Dolibarr and DoliPos Open Source project). You also keep control on all your data (full files and database access).